Uncontrolled wildland fires occur naturally. Wildfire is an integral part of its ecosystem. Fire Ecology is the study of fire dependence, the adaptation of plants and animals to wildfires, and fire effects on ecosystems. No matter how intently one studies the hundred little dramas of the woods and meadows, one can never learn all the salient facts about any of them. 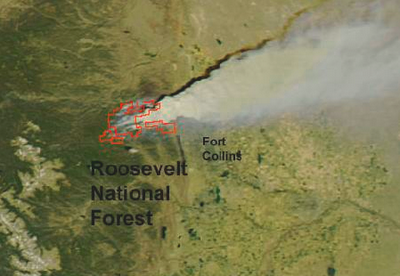 The High Park fire is burning in the Arapaho and Roosevelt National Forests and the Pawnee National Grassland in north central Colorado. Thick timber and large stands of Mountain Pine Beetle-devoured trees provide the fuel. High winds and hot, dry weather caused the High Park fire spread rapidly over tens of thousands of acres. Many plant species require fire to germinate, establish, or reproduce. 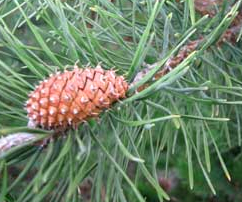 The Lodgepole Pine depends on fire to germinate, establish, and reproduce. Lodgepoles produce resin-coated, serotinous pine cones. The resins seal the scales of the cones protecting the seeds inside. Lodgepole seeds often remain sealed for decades. Eventually a passing fire provides enough heat to melt the resin. The cone scales open up to release their seeds to the forest floor. Without wildland fires, Lodgepole seeds would likely never be released. The heat from the fire does not penetrate the soil more than a few centimeters. This affords the seeds the required nutrients to quickly germinate and to give life to a new generation. Aldo Leopold (1887 – 1948). American author, scientist, ecologist, forester, and environmentalist. Wikipedia. Tinker Lab for Forest and Fire Ecology. University of Wyoming. Yellowstone Fires: Ecological Blessings In Disguise by Liane Hansen for NPR.